Its my first Bloggers & Bags series for the year and I thought I’d kick it off by featuring one of my fave people that I’ve met on Twitter last year. 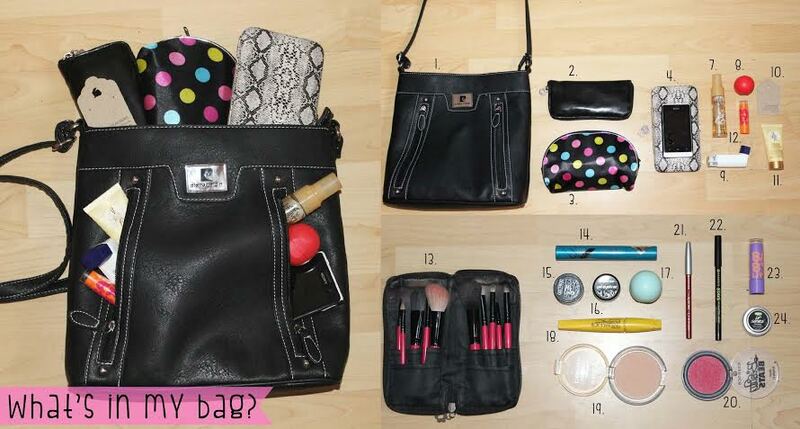 Today I’m taking a looksee into the handbag of Naeemah that blogs over at The Jam Jar. Naeemah’s blog is definitely one of the less pretentious blogs on the interwebs and I enjoy reading what goes on in the head of my friend with the specials needs. wearing ever since I bought it. I love over Across The Body type of handbags because it’s not in the way and your hands are free to do whatever. So what’s in my handbag?? I hope you and your readers enjoyed looking into my bag! Thank you Naeemah my blogger bestie for showing us what you carry around. I was definitely expecting an empty Wakaberry container in your bag. Tags: 27pinkx, Avon, Beauty Blogger, Bloggers, Bloggers and Bags, Brands, Catrice, Eos, Essence, Facebook, Factorie, Lush, Maybelline, Naeemah, Pierre Cardin, Sony, The Body Shop, Twitter, Wakaberry, Youtube. Bookmark the permalink. Namzie got so much stuffs in her baggie!!! Hehe agreed! If she could carry her whole life in there she totes would! Love that weirdo! This is Cool, it’s something like my ~She Bags~ segment on my blog.